A FAMILY of three will have to pay about HK$36 to HK$52 a month when the government’s waste charging scheme kicks off in the second half of 2019 at the earliest. There will be a penalty of HK$1,500 for those who use the wrong bags. Secretary for the Environment Wong Kam-sing (環境局局長黃錦星) said the scheme will charge differently for residential and commercial users. Residential buildings and village houses will use the ‘by bag’ mechanism, where residents will be charged based on the number of used pre-paid garbage bags. 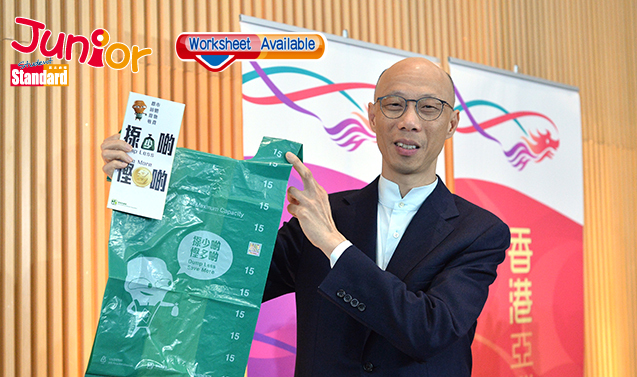 Households will be required to buy any of nine designated bags for packing rubbish. The smallest bag is three litres and the largest 100 litres. At 11 cents per litre, the price of a 10-litre bag will be HK$1.1. Rubbish which cannot .t in the largest bags will be labelled ‘over-sized’ waste. Residents can buy the bags and over-sized waste labels at 4,000 selling points, including supermarkets, post of. ces, pharmacies and vending machines. Enforcement staff will patrol buildings and conduct spot checks at refuse collection vehicles and refuse collection points. “We should take up our social responsibility to reduce waste for Hong Kong and the Earth,” Wong said. A green group said the charging level is reasonable. But a lawmaker said the price level is too high for grassroots, who should be exempted from the scheme.